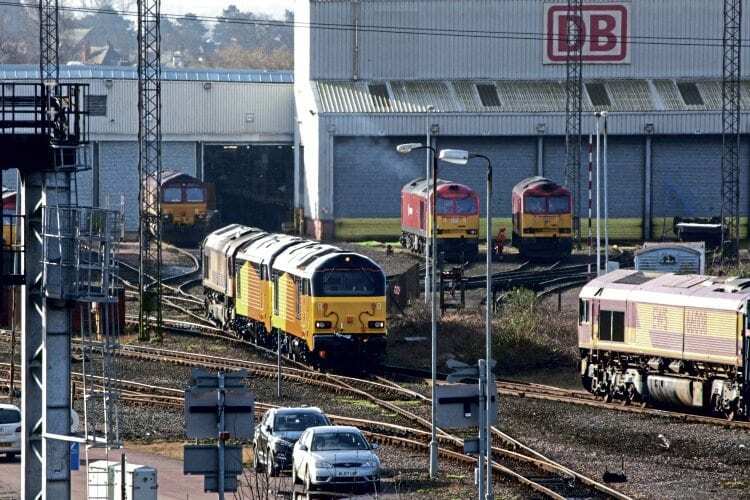 FEBRUARY saw DB Cargo complete work on returning Nos. 67023 and 67027 to operational status ready for their new life with Colas Rail. While No. 67027 was already at Toton, it was joined by its classmate on February 6, No. 66127 hauling it across from Crewe Electric along with Nos. 66056, 67007 and stored No. 67004. Three days later, No. 67027 made its last outing in DB red, working a light engine test run to Doncaster and back in the company of No. 66097 before entering the paintshop. No. 67023 was noted undergoing load bank testing before also receiving a coat of orange and yellow. By February 24, both were repainted but lacking any brandings or numbers, but these were in place by March 1 with the duo moving about Toton and looking ready for handover. ■ Having notched up a year out of service, repairs have finally commenced on collision-damaged No. 70803 at Laira following the arrival of new parts from America. The GE machine was moved inside the depot in early February. Read more News and Features in the April issue of RE – on sale now!